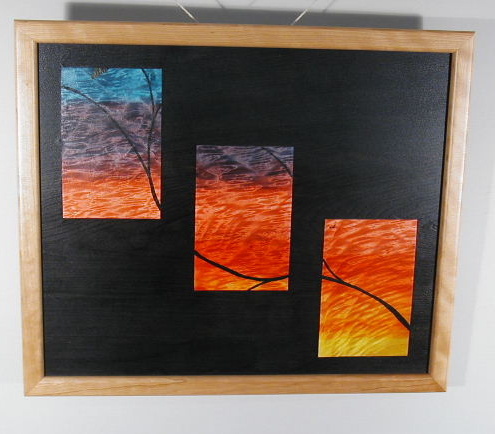 Wall Art sculpture, mixed media "Inside Out Outside In"
"Inside Out" - Quilted maple, european birch, aniline dyes. 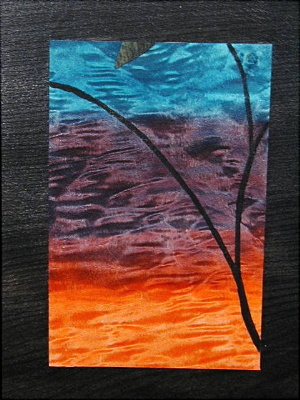 Looking out of a darkened room, "Inside Out", you see a red sky of the dawn, dark shadows of a vine and the tip of a small leaf. The view is to the east. From the "Outside In" you see the outside wall, the same vine and plants, the shaded view of the inside wall and the window openings on the opposite wall. The sky is a view to the west on the same morning but slighly later than the dawn viewed in the "Inside Out". You had a cup of Joe before walking outside and looking back.